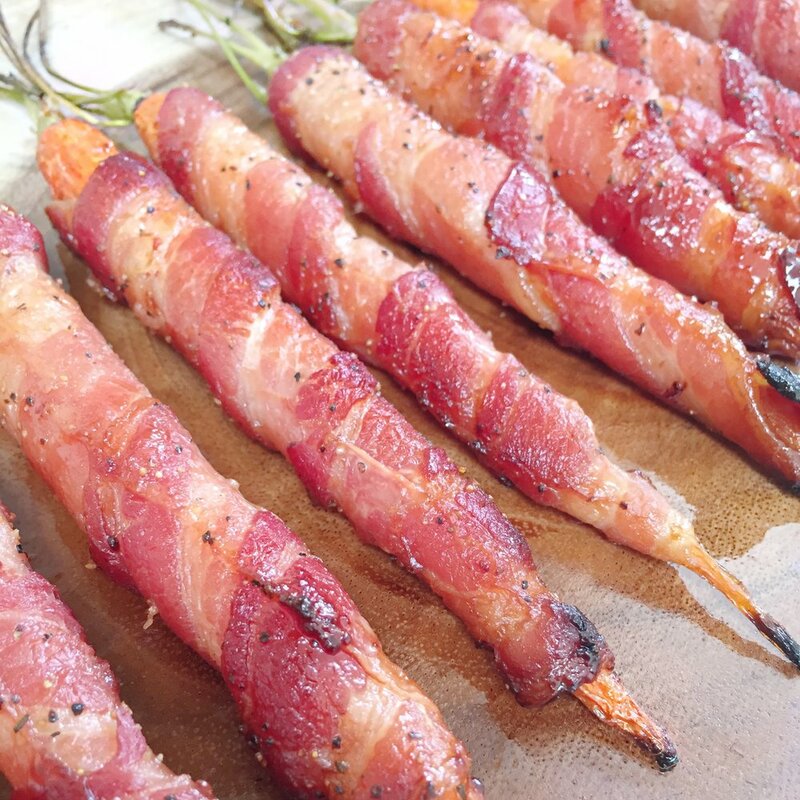 These maple bacon carrots are the perfect addition to any dinner table! Ok, so Easter is almost here and it’s time to post the obligatory extra yummy, only eat a couple of times of year vegetables. But I guess you can look on the bright side and say at least your eating vegetables right! When I first made these carrots Aaron said they were the best carrots he had ever had, and that’s a big deal because he LOVES roasted carrots! But let’s be honest, who doesn't love bacon and maple syrup! These are also really easy to make which when you already have a big meal to make is a win. You can wrap your carrots in advance and bake when you're ready. I do recommend you use a medium-sized carrot because if you small carrots they will cook quicker than the bacon and your carrots will be mushy and no one likes mushy carrots. These carrots are also extra delicious with the addition of the maple syrup and pepper. These are classic flavours that pair so well together and also pair so well with a big classic turkey dinner. Give these a try this weekend, I guarantee that your family will thank you! Preheat oven to 400 then line a baking sheet with parchment paper. Clean and peel each carrot then wrap 1 strip of bacon and place it on a prepared baking sheet. Brush each carrot with half of the maple syrup then sprinkle with black pepper. Bake for 15 minutes flip then brush with remaining maple syrup and additional pepper. Bake another 10 minutes or until bacon is crispy and carrots are tender. 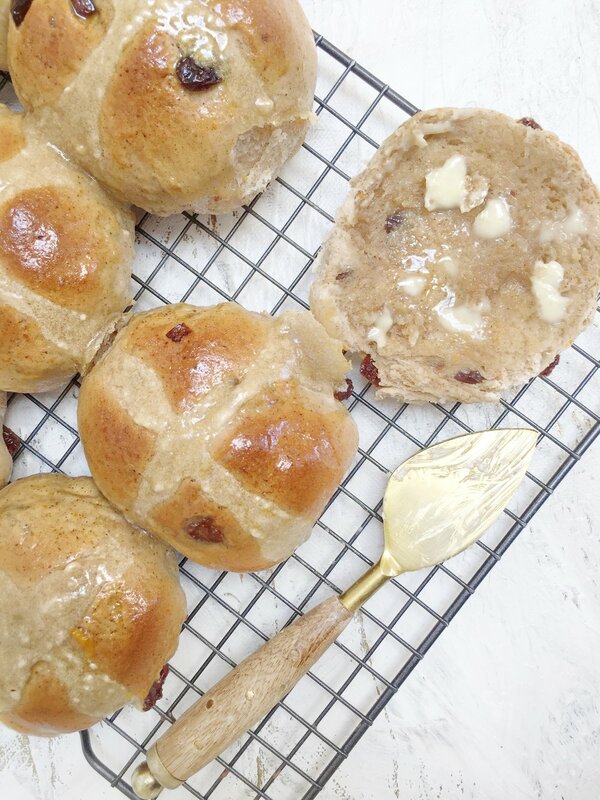 The classic Easter bun, with delicious spices and chewy raisins it’s the perfect treat! So hot crossed buns are certainly a new love of mine. When I was a kid I wouldn’t go near them, probably because they had raisins in them, but then one day something strange came over me and I bought a bag of them and let’s just say, life has never been the same! It’s kinda sad to me that these delicious little buns are only available during the Easter seasons but I guess that’s part of what makes them special. I think what I have come to love about them is the spiciness. It’s like an upgraded version of raisin bread only better. And the glaze, it really throws these delicious little buns over the top. Now I think that I always thought that the crosses were icing and was disappointed to find out that it wasn't, but this the addition of vanilla it gives the crosses a bit of pizzaz that I think they need. I’m also not opposed to icing crosses - maybe next year. So here is the other thing, if you don’t love raisins the great thing with making your own is you can leave them out. While that may not be traditional they are your hot crossed buns so do what you want, that’s the best thing about baking for yourself! And if you eat the whole batch yourself no one will be there to judge you! In the bowl of a stand mixer place yeast, 2 tsp of sugar and water and stir until combined. Allow to sit for 10 minutes or until frothy. To the bowl add remaining sugar, flour, spices, salt, raisins, oranges zest, egg and melted butter. Using the dough hook mix until it is elastic and smooth. Cover with a clean damp towel and allow to sit for 30-90 minutes or until doubled in size. Line a baking sheet with parchment paper then remove the damp towel and punch down to deflate. Turn out dough onto a floured surface and knead gently for 1 minute then form into a log. Cut into 12 equal pieces then form into a bun shape. Place on the prepared baking sheet then repeat until all of the dough has been used. Cover once again with the damp towel and allow to rest another 45 minutes. Preheat oven to 350. In a small bowl combine the flour, vanilla and water and stir until smooth. Place mixture in a ziplock bag then snip the corner. Pipe crosses over the buns going slow so that it curves each bun. Bake 20-23 minutes or until golden brown. While baking combine the juice of the oranges, honey and butter and simmer for 15 minutes or until thickened. Remove buns from the oven then while still warm brush them with the glaze then allow to cool on a cooling rack. Nothing screams summer more than strawberries and whip cream! This pie brings those yummy ingredients together in one amazingly fresh and delicious bite! Ok, so this pie is a blast from the past for me! As a kid, we had strawberries in our back yard and from time to time we would have fresh strawberries pie, it is one of those desserts that I hadn't had in years yet thought about often. The only problem is the pie we use to have had a glaze on it that was, gasp, store-bought and unfortunately, I haven't spotted that lovely little package since I was a child. So I knew that I needed to figure out how to recreate that delicious pie but sadly most recipes I was finding in my research involved jello. Now here is what you need to know, in my opinion, it should not be a jello consistency but rather more of a glaze. The strawberries need to be the star of the show with this one and I worry that by using jello it would take away from that. So I finally found a few recipes that were thickening with cornstarch and I finally felt like I was on the right track, the only thing was is that they were putting the mashed strawberries through a fine sieve leaving all that strawberry pulp which just seems so wasteful to me. So, as usual, I pulled out the ever-versatile food processor and it luck for me, perfection! I also wanted to make this pie as easy as possible so I used a store bought crust but feel free to make a homemade crust if you have the time/inclination to do so. Now to the outcome - this pie is just as good as I remember and I wanted to make a second one the minute it was gone. It would be the perfect dessert for Easter or basically any bbq or brunch all summer long! Cook pie crust according to directions then allow to cool. In a medium saucepan place 2 1/2 cups of the strawberries then mash using a potato masher. Add in water and simmer for 5 minutes allowing the strawberries to completely break down. Transfer the strawberries to a food processor and blend until smooth. In the pot combine sugar and corn starch and using a whisk. Add in the strawberry puree and bring to a boil for 1 minute, reduce heat then simmer until thickened (approx. 2 minutes) stirring constantly. Remove from heat and whisk in lemon juice. In your cooled pie crust layer in 1/2 of the remaining strawberries then pour over 1/2 of the glaze and repeat with remaining strawberries and glaze. Allow to cool in the refrigerator for a minimum of 3 hours to set. Top with whip cream. 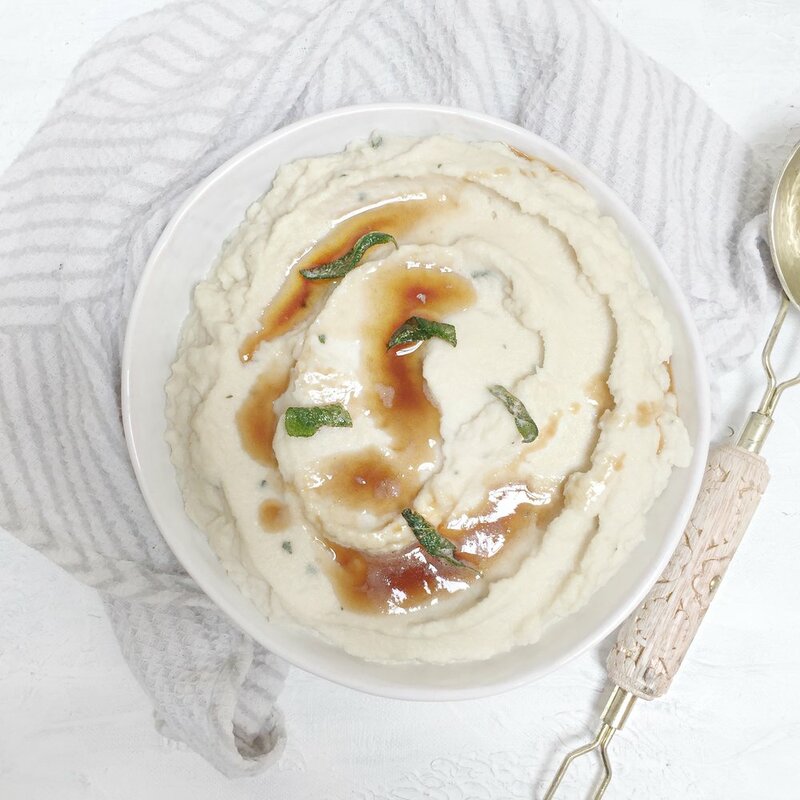 Switch up your usual mashed potatoes with this indulgent and creamy cauliflower puree, I promise you won’t even notice your eating vegetables. Ok, seriously guys this is a recipe that is just so yummy! With Easter coming I have been thinking about ways to lighten up what tends to be a heavy meal without losing all of the amazing flavours that are expected during the holidays. Now for me, the mashed potatoes are one of those things that if done well are the highlight of the meal, but with this Cauliflower puree you may have a new star. Now, have you guys made brown butter before? If you haven’t you seriously need to go and make some right now!!! it’s so easy and honestly so good. The extra flavour that it adds is nutty and it will leave your guests wondering what your secret ingredient is. Another bonus, this cauliflower stands alone so if your meal doesn’t include gravy, no problem. I also love the flavour of sage in this puree but you can use any herb that you love. Thyme or Rosemary would be super lovely and based on what you are serving for dinner it's easy to adjust to make it with complementing flavours. I also use my food processor to make my mashed cauliflower but you can use a traditional masher, blender or mixer. The best thing is that unlike potatoes you don’t need to worry about your puree becoming overly starchy with over mixing, so go ahead and get that cauliflower silky smooth. So this Easter switch things up and serve Cauliflower Puree, I’m sure your guests won’t even miss that mashed potatoes! In a large pot place cauliflower florets and garlic cloves and cover with cold water. Bring to a boil then simmer until fork tender (approx. 10 minutes). Drain then place in a food processor and blend on high until smooth. Finely chopped half of the sage leave and place them in a small pot with the cream or milk. Turn on low and allow to warm. In a second small pot add in butter and remaining whole sage leaves. Bring to a simmer and cook until butter becomes foamy then golden brown then carefully remove sage leaves. To the pureed cauliflower add milk, butter and salt to taste. Blend to combined then serve immediately. 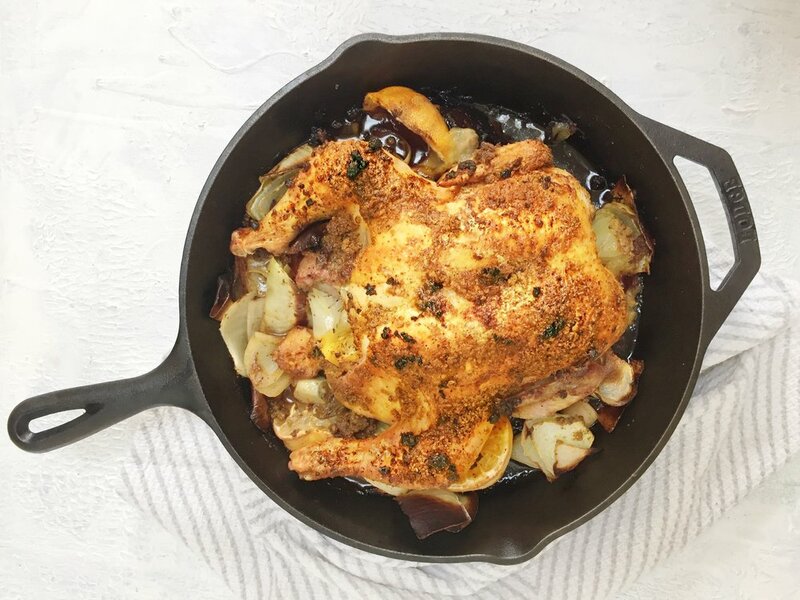 This lovely Indian Spiced Roasted Chicken is the perfect weekend dinner. Who knew something so easy can feel so special! Who doesn’t love a beautiful roast chicken! I think it’s one of the most delicious and special meals yet it’s actually one of those things that is remarkably easy to throw together. I don’t know about you guys but I use to think cooking a roast chicken seemed as daunting as cooking a turkey. I felt like if I did it I would need all the sides and it would turn into a long and complicated meal, but I have since learned that is certainly not the case. It can be just as easy as cooking almost any protein, it just might take a little bit longer. But seriously, how easy is it to slather some butter on a chicken, season and roast. Plus, if you're like me you have less of a chance of overcooking it like a chicken breast (which I’m famous for doing). I also love to stuff my chicken with aromatics. It gives that extra oomph of flavour and also helps to keep its shape, now you certainly don’t need to stuff it but you don’t you risk your chicken collapsing. Plus, if you’re like me and you make chicken soup at every opportunity those onions can do double duty when making your stock. I also really love switching up how I season my chicken and this Indian spice Rub doesn’t disappoint. Serve this with a curried fruit and fragrant rice and you have one of the most delicious meals ever!!! Preheat oven to 450. To prepare you chicken pat dry then place in an oven safe dish or pan breast side up. In a small bowl combine coriander, turmeric, currie powder, ginger, pepper, the zest of 1 lemon and finely chopped garlic. Stir until well combined. Slice onion and lemon into quarters then stuff inside the chicken. Coat the chicken with softened butter then sprinkle liberally with spice mixture. Roast in the oven for 15 minutes then reduce heat to 350 and roast an additional 20 minutes per pound. Use a meat thermometer to check internal temperature to ensure chicken is fully cooked. Allow to rest for 10 minutes before slicing.